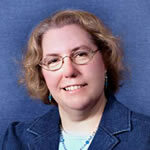 Resa Kerns is the Associate Law Librarian for Emerging Technologies at the Univ. of Missouri-Columbia. She has taught first year Legal Research, and Advanced Legal Research. She works with other faculty members to integrate a variety of technology tools into their classrooms, and to supplement their classrooms. Resa received her B.A. degree from Kansas State University in 1984, her J.D. from the Univ. of Texas in 1987, and her Masters in Library Science in 1999. Prior to her career as a librarian, she practiced law in Austin, Texas.